Last year I compiled my list of ideas as to what the perfect paddock presents would be in Formula 1 and, well, it only seemed fair to give it a go again this time round as it turns out this Christmas lark seems to come around every year. What better way to spend Christmas than as a happy family playing accusational board games? 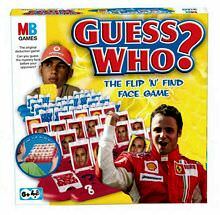 It’s only right that this Christmas Lewis and Felipe play the wonderful Guess Who, where they have to try and guess who crashed into them at the last Grand Prix. Scrabble was on the cards at one point but it turns out frickin’ isn’t in the English Dictionary and many of his words placed down came under stewards review. As for Felipe, Cluedo was on the cards to find out who stole his pace but it turned out it was just Fernando in the Garage with a Car. 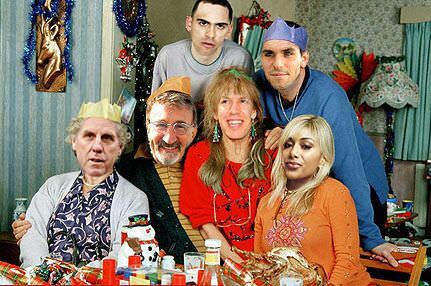 So, this merry Christmas our favourite rivals will be playing a jolly game of Guess Who! It’s not shameful to admit sometimes that you need a helping hand, especially when you’re still learning something and this Christmas, getting Pastor some armbands to help him cope with F1 might just see him stay afloat all year. Sure, armbands are only really used for swimming to help new swimmers in the water but these armbands can be used to protect Pastor from the barriers and keep drivers away if he drives into them. Multi purpose armbands are the way forward! Although they do come with the added bonus of considerable financial backing to ensure your purchase is worth it, no matter how flimsy their may be in their use. Hurrah! Once upon a time there was a gentlemen who went by the name of Fernando Alonso. This man, skilled in all the skills of driving and general fastness, once presented himself with a funky little beard until one day... the beard was gone. Exist, no more. Capiche! 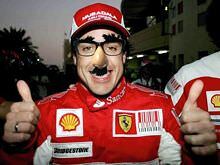 But now, thanks to the miracle of joke shops, Fernando Alonso can once again remember the great times of having a little beard and epic eyebrows with these Groucho Glasses, which also come with free Ray Bon Bons glasses. They were supposed to be Ray Bans but it turns out joke shops don’t sell £400 glasses so they had to settle for the Poundland rip-offs. The important thing here is Fernando once again can rock his facial hair this jolly holiday time! Jenson’s had a great, great season, but let’s be honest what his true passion is – cake. He loves cake. He walks past a bakery, he sees cake. He heads into McLaren’s cafeteria, he gets cake. He falls down to last place, passes everyone and beats the World Champion on the last lap and he knows what he’s getting – plenty of cake. Basically, Jenson’s desire is to see all the cakes in the world. Madeira cakes. Christmas cakes. Those little cakes with the the cherry in them cakes. Fish cakes. He wants cake. Cake. So this Christmas, let’s give Jenson double cake. Yes, that’s right, it’s a cake with twice the cake-ocity of a normal cake. So it’s not just one cake Jenson, it’s a double cake. Look how happy he is with that cake. Two cakes in one, a mega cake, the cake of all cakes, a cake suitable for a driver like Jenson who’s impressed so much in 2011 with make cake deserving drives. It’s time for festive fun, but more importantly, it’s time for double cake. And no, Jenson – the cake isn’t a lie. 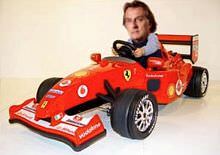 For the past 41 years Luca has been harping on about how much Ferrari want to have a third Ferrari in the paddock and how it would be so wonderful for the sport if they did, so this Christmas, make a veteran of the sport happy by getting him a kids’ toy Ferrari so he can finally drive up and down the paddock in his little pedal car and get that third Ferrari into the paddock like he has so often desired. Yes, whilst Sky and BBC present away with their coverage, watch in joy as an old man pedals about frantically in the background as he struggles to come out the back of the Ferrari garage unveiling his third Ferrari in the sport after all these years. Just imagine the smile on his face as he unwraps it on Christmas morning then holds a press conference an hour later to unveil it before whispering about it to his online friends! Yay! Thursday Thoughts - What do you want to get F1 for Christmas?